25 years after he first bumped into Chris Lowe in a Kings Road Hi Fi Shop and 22 years after their first number one hit West End Girls, the Pet Shop Boys remain one of the worlds biggest pop bands, and Neil is the first to admit hes increasingly interested in the forces of fate and serendipity. Fast forward to the present and the pair (whove remained best friends and musical partners throughout their career) are just about to release their already acclaimed latest studio album Fundamental, a record thats explicitly (and controversially) themed around the rise of religious fundamentalism. ‘Im against fundamentalism of any sort; I think we all are, arent we? We dont want to go back to the seventh century, thank you. I think we take religion too seriously,’ Neil explains. ‘As a society, here in the UK, we dont really respect our state religion as it is, whether its the Church Of England or Christianity, sure we pay a bit of lip service, for example, we might like the music and the incense and all the rest of it, but we can laugh at it nowadays and we can mock it pretty much with no threat,’ he continues. A former Smash Hits journalist and notoriously waspish critic of politically conscious pop stars in the past, hes sensitive to accusations of hypocrisy though equally determined to speak out, he insists, with civil liberties the issue hes most concerned about. 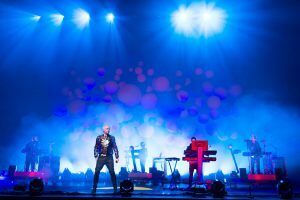 ‘Some of our fans have been complaining that the Pet Shop Boys have gone political, because of course weve always slagged off groups for being political in the past, but what I dont like is people being self-righteously political in a way that gets them lots of publicity, not mentioning any names,’ he explains. Though taking themselves too seriously is a charge the Pet Shop Boys have often faced, the duo have always used humour as a core component and new album Fundamental is similarly constructed, despite, even because of, its serious intent. Singling out two new songs as examples, Im With Stupid (a track inspired by the relationship between Tony Blair and George Bush) and Lunar Park (with the words, I was just comparing America and its culture of fear to a fairground) Neil admits he prefers directness these days, with ridicule a powerful tool. Skrufff (Jonty Skrufff): Starting with Fundamental, would you say it was an easy album to make? Skrufff: Was it a matter of giving Trevor Horn carte blanche? Skrufff: The track I like the most is Lunar Park . . .
Skrufff: Were you feeling particularly creative on this album? Neil Tennant: ‘If you take Lunar Park as an example, I have ideas for songs all the time, like titles and concepts. Id written Lunar Park down as a title first and also Id written down the line Its always dark in Lunar Park, then I saw Michael Moores film ‘Bowling For Columbine’ which I didnt particularly like on the whole, though I thought the first part was really good where hes talking about the culture of fear in America and how it is used. I also saw some interesting documentaries that a friend of a friend of mine made about Al Qaeda and they both had some influence on me in terms of lyrics. I have a house in County Durham where we record sometimes and I have a grand piano there- I went out one day to buy a sofa and came back with a grand piano from an auction room- and I found that chord change at the start which sounds really good so I started to write. Skrufff: Given that the album is called Fundamental, do you see the gay rights issue becoming a big clash between fundamentalists and secular society? Neil Tennant: ‘What is the moderate Muslim position on homosexuality? What actually is it? I think its actually something reasonably horrifying. I read that some guys have recently been killed in Iraq for being gay. But actually in Britain I find the whole gay issue a bore really, Ive always said it is a political issue. The whole idea of gays was created in the 1970s as a political reaction against oppression and as the oppression fades away, so the idea of gay will fade away and we will lose our obsession with someones sexuality, which I still believe is a weird thing. I also feel its forcing people to be either gay or straight or whatever. Skrufff: I didnt realize youd played live as much as you have. What kind of show are you planning for the festivals? Skrufff: Youre playing at Serbias Exit Festival in July, for you guys is it another festival along a series of them? Skrufff: Do get you get real natural highs when you are onstage in front of 50 000 people? Neil Tennnant: ‘Yes, when its working totally. Weve been on quite a journey with regards to live performance, in that we didnt use to perform, originally we never performed live. Our first proper live performance was at the Fridge in 1984, when we just played three or four songs. Then in 1989, since we always had this idea of doing a theatrical thing, we worked with Derek Jarman. Two years later we did the English National Opera tour with Es Devlin. One of the reasons we did that was to hide behind them and also we wanted to do something that was totally un-rock. Then in the late nineties we did a show at the Savoy Theatre for three weeks which lost money, so our manager suggested to break even, we performed the show at some festivals so we did the Roskilde festival. Id never been to a rock festival in my life before and suddenly we were headlining the biggest one in Europe. It went down amazingly well actually, and we started to quite like the idea of doing festivals in the summer. Skrufff: I read about you meeting West End Girls producer Bobby O two years to the day after meeting Chris in the early 80s, what made you speak to each other in the first place? Skrufff: Didnt you like that song? Skrufff: England is awash with cocaine addiction stories and Dave Gilmour and Andy Bell have openly spoken about it, how have you guys managed to avoid not to become a casualty? Skrufff: Dave Gilmour was blaming the people who were around him were effectively using him, so he became the gu that was buying it and he had a load of dodgy friends who took from him . .
Skrufff: Have you gone through many existentialist crises, those Why am I here? What is it all for? moments? Then again, if we werent writing songs that we really believed in, I guess we wouldnt be doing it. I love the songwriting process. When we played our tracks to Trevor Horn for the new album, he said they were great. Its rare to have someone coming in whos got all these songs you really want to work on. Once we went to the studio with Brian Eno, who we always wanted to work with, but one of the things Brian Eno does, is come up with strategies to help you write songs. We arrived in the studio with a cassette of twelve funky demoed songs; we could have written completely new songs with him, its something that comes naturally to us, like a real energy flow about songwriting in the Pet Shop Boys. We could bring out two albums a year if we wanted to. Skrufff: How much does your happiness coincide with the peaks and success? Is there a correlation? Fundamental is out shortly on EMI/ Parlophone.